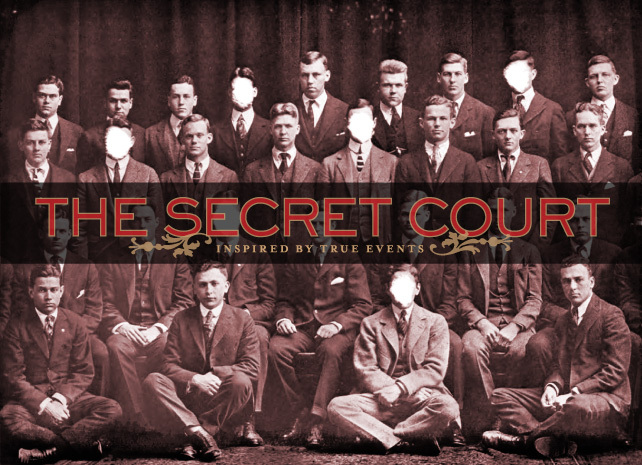 The Secret Court is a new play based on the true story of a 1920 ad hoc disciplinary tribunal at Harvard University formed to investigate charges of homosexual activity among the student population. What began as an inquiry into the mysterious death of a student, soon becomes a campus-wide inquisition. In all, 45 young men were interrogated behind closed doors; 14 were declared guilty of “homosexualism”—the sentence for which would haunt them the rest of their lives. The Secret Court is not merely a denouncement of an institution’s fear and of society’s intolerance, but a true American tragedy of lost hope and wasted potential. Plastic Theatre (Author) is a rolling ensemble of multi-disciplinary artists led by Tony Speciale. For The Secret Court the company includes Catherine Barricklow, Jess Burkle, Joe Curnutte, Frank De Julio, Heather Denyer, Max Jenkins, Zach Kleinsmith, James MacBean, Jerry Marsini, Patrick McCaffrey, Nicholas Norman, Kila Packett, Adam Rihacek, Peter Allen Stone and Tony Speciale. Collaboratively written, The Secret Court incorporates elements from over 500 pages of historical court documents including transcripts, summaries, correspondence and other university records. Live Ideas is an annual humanities festival of arts and ideas, exploring the ideas, controversies and thinking informing a different bodily-oriented theme. This season’s theme: Radical Vision. Radical Vision is fueled by the desire to find the temerity to change the things we cannot accept. How do we not simply protect democracy, but make it stronger? What are new (radical) ways forward—ways that go to the roots of our current democratic crisis? The festival will present five days of activity around the idea of an open society, to imagine its future and understand its past. Through public forums, performances, readings and workshops, New York Live Arts conducts a forward-looking, critical appraisal of key democratic institutions including the press, technology corporations, criminal justice, electoral process.